During the height of the Cold War in the mid 1950's, the US Army began building the bases that made up its Nike Missile program. This was designed to be a last line of defense against an enemy air attack which was a threat during the Cold War. Nike was the Greek Goddess of Victory. Rings of these Nike missile bases, also known as batteries, were built surrounding major metropolitan areas in the US. Prior to the Nike program, tht Army operaed rings of Anti-aircraft Artillery (AAA) Battalions that surrounded these cities. The AAA sites were much smaller than the Nike sites and were located closer to the cities they protected, often in the middle of residential areas. The Nike sites were situated further away from the cities, usually in rural farm land. Nike bases had two seperate sections, seperated by 1/2 mile or more and sometimes in different towns. One section was the Control Area, also known as the IFC for Integrated Fire Control. This section contained the radars and computer equipment that searched the sky for enemy aircraft and controled the launching and guidance of the missiles. This section was normally on the highest piece of ground at the base. The Mess Hall and Administration Building were usually located in this section. The second section was the Launch Section. It was here the missile components were recieved and assembled. After assembly the missiles would be fueled here and then stored in underground magazines. They were stored below ground for safety reasons. The missiles were pushed across a rail to an elevator which would lower it into the magazine. The missiles were brought to the surface for testing and repairs the same way. Each magazine had four launchers, with one launcher on the elevator. Both sections had seperate barracks, as the personnel in the Control Area were not authorized to enter the Launch Area. There was sometimes a rivilary between the two sections with the men in the Launch Area feeling superior. The bases were in operation around the clock, and guarded at all times. Duty would consist mainly of monitoring the radars, testing and maintaining equipment and guard duty. Drills would be conducted regularly and sometimes unidentified aircraft would enter the defense area and bases would go on stand-by until the aircraft could be identified. About 100 men would be stationed at each base. No missles were ever fired from any of the Nike bases. There were two models of Nike missiles. The original model was the Nike-Ajax, 34 feet tall and 4 feet wide with speeds up to 1,600 MPH at 70,000 feet altitude. Later in the 1950's a more advanced model , the Nike-Hercules, was being deployed to selected bases. The Hercules reached speeds up to 3,200 MPH at 100,000 feet and unlike the Ajax could shoulder nuclear warheads. With the Hercules, less bases were needed to protect an area. The Nike missile program was deactivated in 1974, with the execption of some bases in Florida-which were also deactivated by the end of the 1970's. Philadelphia was one of the cities protected by the Nike program. The city was surrounded by a ring of 12 Nike bases built during the mid-late 1950's to replace a ring of AAA sites. One of the bases was located in Marlton, NJ. The Marlton base was designated PH 32, the 'PH' standing for Philadelphia Defense Area and the '32' meaning the base was 32 degrees Southeast of City Hall in Philadelphia. The Marlton base was built in early 1955, over 38 acres of the Phillips Farm on the East side of Tomlinson Mill Road between Elmwood and Taunton Lake Roads. The Control Area, the only visible portion to passerby, was along Tomlinson Mill Road. The Launch Area was 1/2 mile back from Tomlinson Mill connected by an access roadway. The area surrounding the base was farmland. The Marlton base was activated July 1, 1955, housing Nike-Ajax missles. Most Nike bases contained three magazines, however the Marlton base contained two. 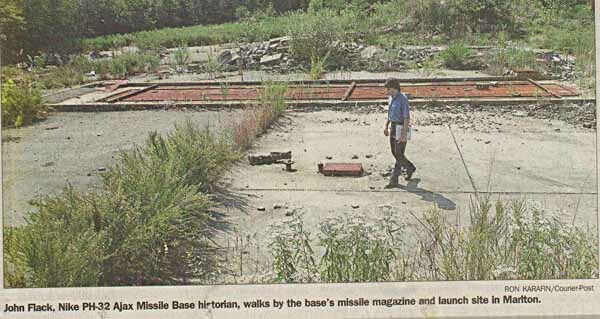 At different times the base housed 16 to 20 missiles. Only five bases in the Philadelphia area were converted to house the Nike-Hercules missiles, since less bases were needed with this more advanced model. The Marlton base was not one of those upgraded and was deactivated, along with the remaining US Ajax-only bases, in 1963. Later in 1963, the base was sold to Burlington County for $32,000 and was converted into the Burlington County Civil Defense Center. This gave the base a second Cold War use as Civil Defense was a means from protecting the population from a nuclear enemy attack. The underground missile magazines were converted into the Center's Emergency Operating Center, which would have been the nerve center of CD functions in the event of an ememy attack. The Control Area was used mainly by local organizations and for County storage. Later in the 1960's, the County's Fire and Police academy was also located at the Civil Defense center-using the Launch Area barrack as a school, the missile fueling area for a target range and the water works area as a fire and rescue training area. Development began to approach the site in the early 1970's, making it less suitable for public safety training and the site was abandoned in 1972. The County had a plan to convert the site into a minimum-security work release prison, however the plan was rejected by local residents. The County had offered to sell the property to Evesham Township, which desired the site for a municipal complex and recreation area, for $142,000 in 1973. The Township declined the offer and a price could not be agreed upon. In a controversial move, the Township planned to rezone the site from residential to public parks and recreation which would lower the value of the property and force the County to lower the price. The County threatened legal action on what it felt was spot zoning. By this time the base fell into poor condition. The County held an auction in December, 1973 to sell the property. Only two bids were received, the winning bid from developer Ray Silverstien for $145,000. In January, 1974 the County rejected the bid and withdrew the auction. The County felt it could receive a higher bid at an auction held at a later time after the controversy and confusion over the site died down and blamed the low turnout on this. However, Silverstien eventually purchased the site from the County. The funds from the sale were used to build the current Public Safety Center in Westampton. Silverstein had planned to build a housing development, Spring Run, over the Control Area and donate the Launch Area for a school site. All the buildings at the base were demolished in late 1977 after the development won approval from the Township. However, Silverstein failed to begin construction within two years and the Township withdrew its approval and development plans were dropped. In the late 1980's the base, as well as most other former Nike sites, underwent testing for soil contamination. The levels of contamination were found to be below what would be considerd a health hazard at the Marlton site. Low levels of Petroleum Hydrocarbons were detected at the Launch site. The base's Control Area was sold in the early 1990's to another developer, Chuisano, who built the Briarwood development there. The Launch Area remains undeveloped. In 2001, Evesham Township contracted W. Hargrove Demolition to remove the debris from the Launch Area. This debris remained from demolishing the base's buildings and some illegal dumping of tires and appliances. This work was completed in early 2002. In addition to cleaning up the site, asphalt was laid over the elevator doors to make this area safer. Ownership of this portion is a mystery. Public records show the owner as the Evesham School board, but this is said to be incorrect since the previous developer never actually deeded the tract to the Board.